Have you ever made a card that you like, but you think it could use a little something else? Well, today I have a card that I did that to. The original card was nice and actually very quick and easy, but I felt like it needed just a little bit more. Sometimes you have the time to "step up" your cards, and sometimes you may not. 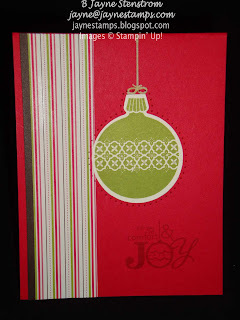 That's part of the beauty of stamping - you can decide how much you want to do on a card. But one caveat - usually "less is more" works best on most cards. You need to know when to stop. Or as I like to say, "Step away from the card!" It uses the Ornament Keepsakes stamp set, Holiday Ornaments Framelits, Word Play (which is one of the word stamp sets that you can purchase the individual stamps from right now! 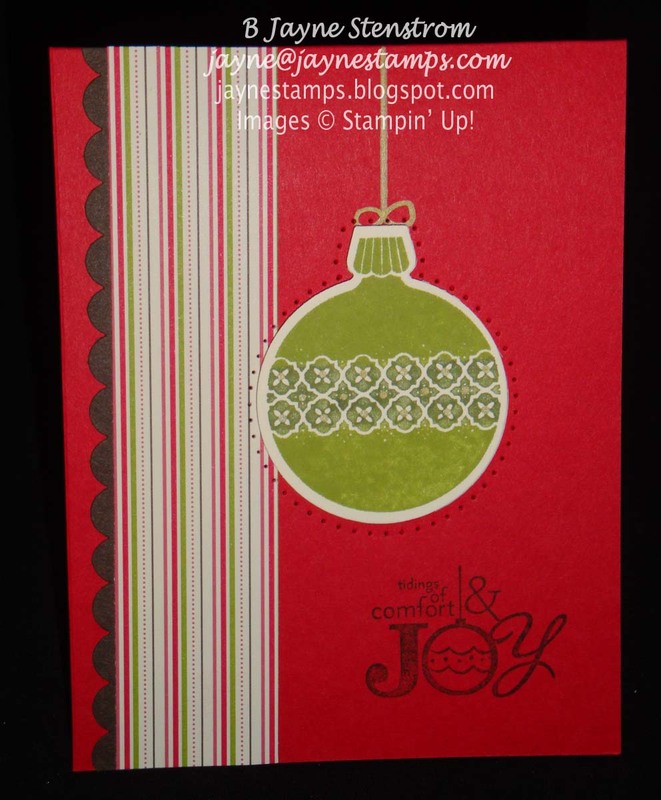 ), Candlelight Christmas Specialty Designer Series Paper, Festive Paper-Piercing Pack, Gold Stampin' Dazzle Marker (in the Holiday catalog - love these! 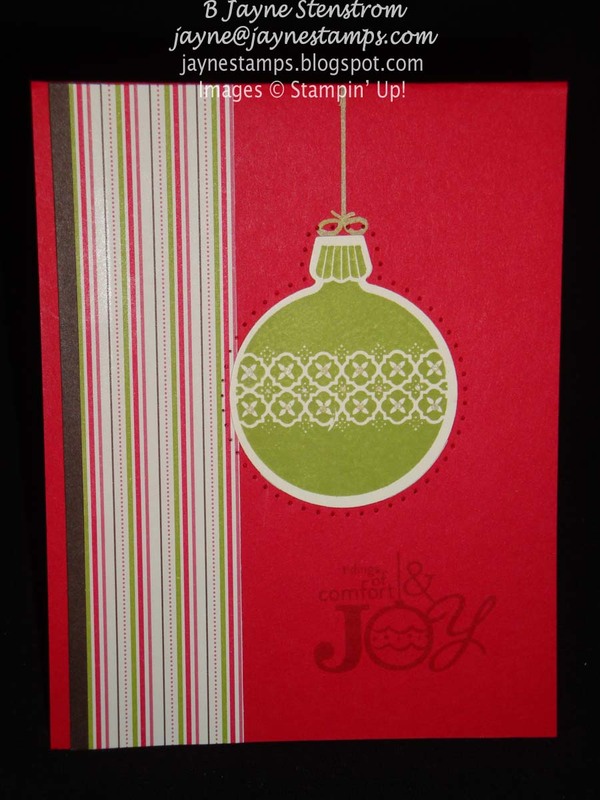 ), Real Red, Early Espresso, and Very Vanilla card stock, Real Red and Lucky Limeade dye inks. It uses all of the above supplies except that I stamped the words in Early Espresso (before I re-inked my pad though, sorry about that! ), the Early Espresso is punched with the Scallop Edge Border Punch, and the center design on the ornament was colored with an Always Artichoke marker to make it stand out a bit from the rest of the ornament. Can you see the slight differences? Are you liking it more or less than the first one? There is no right or wrong answer, it's really personal preference. 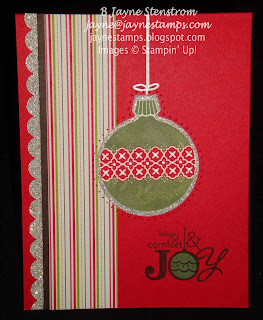 This one has the "bling factor" going with the addition of Silver Glimmer Paper on the side and behind the ornament. Plus I stamped the ornament in Always Artichoke and Real Red, but cut out the center section of the ornament from the Real Red and glued it on top of the green. 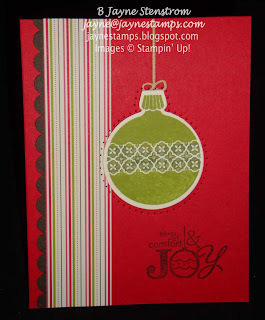 I changed the Stampin' Dazzle Marker to Silver to match the Glimmer Paper, and I used a 3/4" Circle Punch to punch out the "O" in Joy. 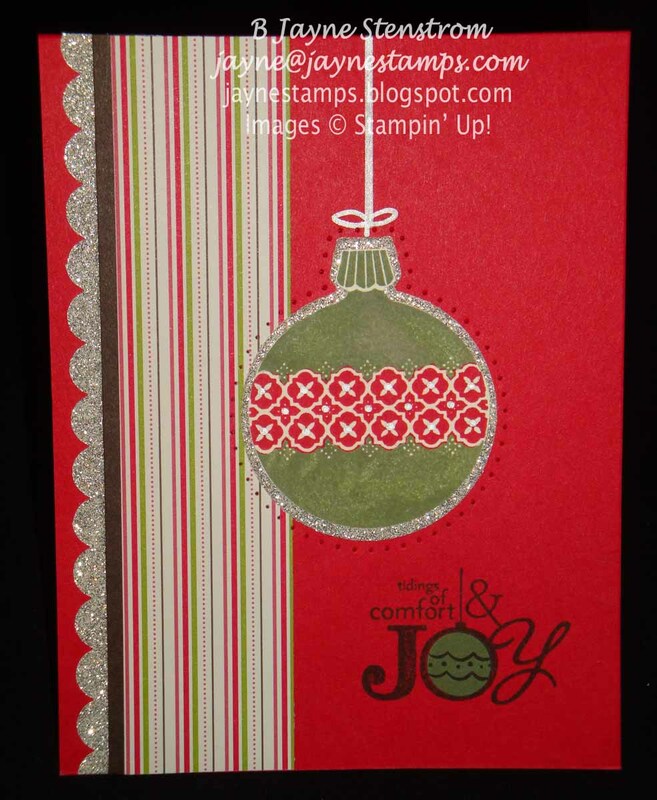 So sometime when you're stamping and you have a little extra time, why don't you try to "step up" your card and see what you can come up with? Or if you're one of those stampers who always put lots of extras on your card, why don't you try taking a "step down" and making your card a bit simpler? You might be amazed at how much you like your "new" version!